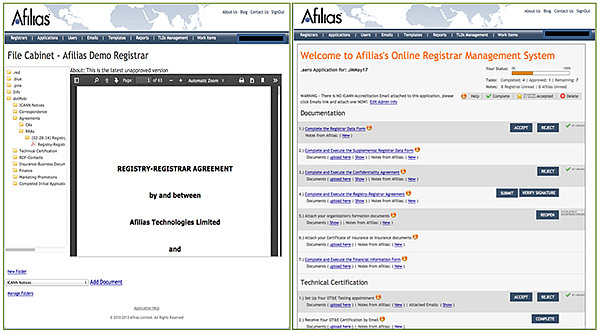 Afilias is the world’s second largest Internet domain name registry, with more than 20 million names under management. Afilias powers a wide variety of top-level domains on the internet. Specifically, Afilias runs the master directories and DNS for over 25 top level domains today. Afilias' specialized technology makes Internet addresses more accessible and useful through a wide range of applications, including Internet domain registry services, Managed DNS and award-winning mobile Web services. Historically, Afilias used a paper process for accrediting and managing their customers. Over time this paper process had become expensive to maintain and slowed the signup of new customers. Using their existing process, a typical signup process for a new registrar took several weeks to sometimes 2 months including shipping packages around the world several times. Afilias needed to automate the new customer accreditation process as well as the customer management process. It was essential to move existing paper to an electronic file cabinet. To be successful and competitive, the accreditation process must become completely electronic (but allow for paper that could be converted to electronic for compliance reasons) with capabilities for electronic signatures and customer self-service. This degree of efficiency and reduction in process time is not only essential to Afilias as they rapidly expand the TLDs they support but also sell services to other TLD owners. Using Salesforce as a customer tracking and reporting system was a first step but with a system for accreditation was essential to eliminate the paper processes which still characterized the solution. Leveraging Salesforce for tracking and reporting, Aflilias desired a customer self-service portal for accreditation and management with data flow into their Salesforce implementation. After evaluating several off-the-shelf options, Afilias & Solutions Street concluded adapting a custom solution was the best choice given functional needs and cost. Leveraging Ruby on Rails technology, Solutions Street built Afilias unique needs into a custom workflow, e-signature and document management system it had built. The full function electronic accreditation system with Salesforce integration went live quickly. In addition, Solution Street provided an electronic file cabinet for Afilias’s existing documents bridging a previously manual paper process into its new streamlined solution. What was once a multi-week process could now be accomplished in a day! And, significant cost savings was realized not only in international postage but administrative and labor costs previously associated with manual document processing. The implementation was so successful Afilias has asked Solution Street to enhance the system with the addition of more features in future releases as it continues to bring on more top level domains (TLDs).